Konnekt’s innovation is recognized as the best choice for seniors living at home, independently or in residential aged care. 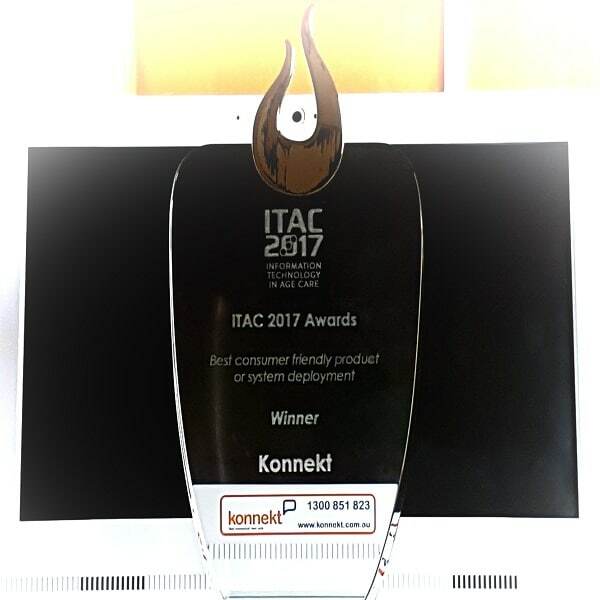 A panel of industry experts chose Videophone from a field of solutions for the elderly, bestowing the prize to Konnekt at this year’s ITAC Conference — the industry’s premier event for showcasing new technologies. 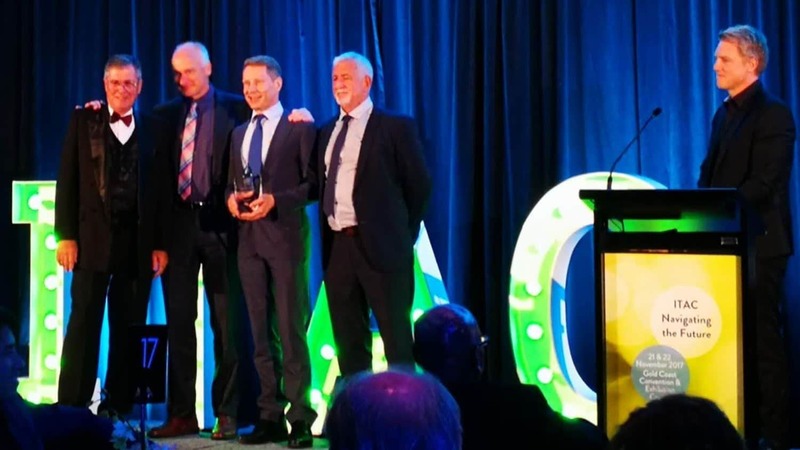 The prestigious award’s judging panel, under the auspices of the Aged Care Industry IT Council (ACIITC), reviewed those organizations that demonstrably focus on Consumer Choice and Quality. Konnekt’s product and service stood out on criteria including originality, the demonstrated return on investment, superiority to existing solutions, the benefit to the residential / home care sectors, and for enhancing the daily lives of older adults. 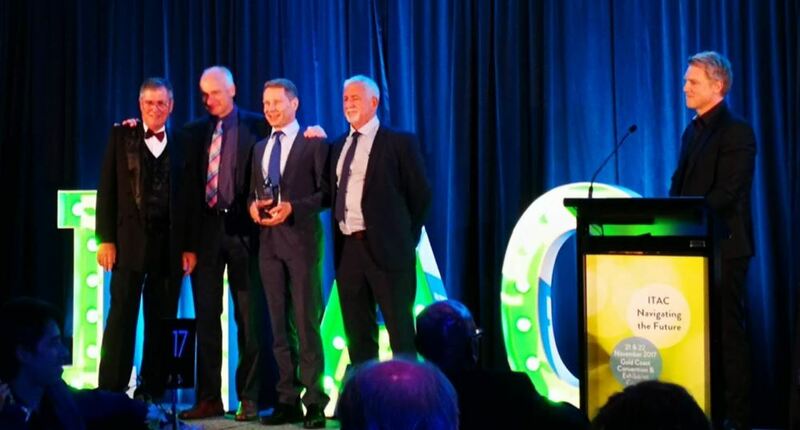 Konnekt is proud to win “Best Consumer-Friendly Product”. Our users typically live alone, or isolated from family in residential care. Many have poor sight, wobbly hands or can’t hear well. They’ve given up trying fiddly little tablet computers. They love being able to use Videophone by themselves because it makes them feel more capable and independent. Every day they see their kids, grandkids and far-away relatives they would otherwise never see again. — Karl Grimm, Managing Director, Konnekt Pty Ltd.
Konnekt’s service includes setup and personalization; unlimited face-to-face calls to mobile phones, iPads/tablets and computers; unlimited calls to regular phones; changes and customization (no visit needed); face-to-face and telephone help; IT support; and (in Australia) even Internet access and custom installation. Our support is especially consumer-friendly. Many sons/daughters and care-givers are themselves over 50 and would rather spend quality time helping their loved ones rather than sorting out Internet devices. — John Nakulski, Marketing Director, Konnekt Pty Ltd.
Approved customers can buy, rent or try Videophone with government funds or a no-interest loan. Aged Care providers use Videophone to enhance the lives of their clients and families. It can reduce undesirable behaviour and the risk of depression. Facilities purchase or lease Videophone to provide a service (alongside newspapers and pay-TV) that connects residents to the community. Lifestyle Managers and Diversional Therapists run activities for groups and individuals at risk of social isolation. The ITAC Conference showcased the changing and evolving nature of technology as it impacts on older persons and those with a disability. 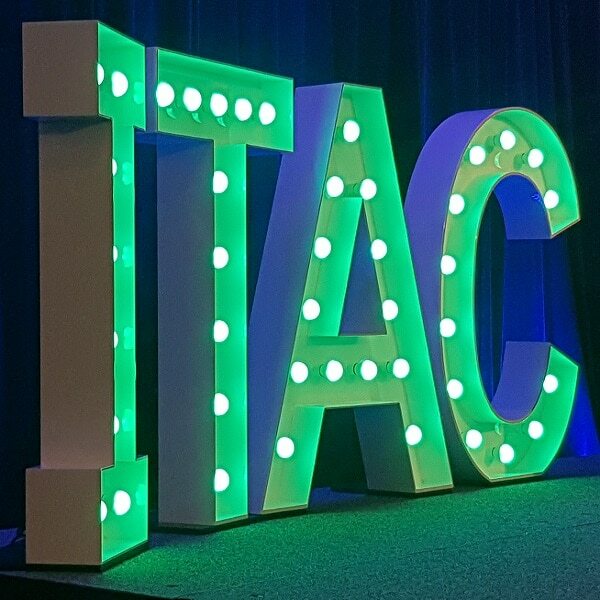 The annual ITAC awards are conducted in recognition of service providers and software vendors who have improved industry performance and/or the customer experience — two crucial components for any system that has quality service as a cornerstone of service delivery. — Rod Young, Chair, ITAC Organizing Committee and a member of the ITAC Awards Judging Panel. Konnekt’s videos show how incredibly simple Videophone is. Contact us to find out how Videophone can be customized for those you care for. Thanks Bob. I vividly recall your support and encouragement at the CEO Breakfast. One of your colleagues is now asking for a Videophone for her 98-year-old Mum!